When my mother-in-law told me many years ago that she remembered Naples being bombed by a German Zeppelin in the First World War, I was skeptical. I knew that the Germans and English had traded dirigible attacks during the Great War over distances of a few hundred miles, but Naples was a thousand kilometers from the enemy Zeppelin airfield in Friedrichshafen, Germany. And a round-trip? It was out of the question. No, it wasn't. The old lady was right. Zeppelin enthusiasts even today still speak of the "legendary" German naval airship, the L59 —the so-called "Africa Ship". L59 was not meant to join the shorter-range fleet of German bomber blimps in the north; she was meant as a long-range ship to resupply troops in what was then the German East Africa colony (present-day Tanzania). In that part of the world, the daring German colonel, Paul von Lettow-Vorbeck (from all accounts, a sort of Lawrence of Arabia with a bit of Garibaldi and Jeb Stuart thrown in), with a force of a few hundred men, was tying down 130,000 British troops who might better serve on the crucial battlefields of the war in Europe. Construction began on L59 (photo, right) in Friedrichshafen, Germany, in August, 1917. This behemoth of the air (225 meters/740 feet long!) would have to fly from the airfield in Yambol (in Bulgaria, a German ally in WW1), the southernmost European airfield under German control, all the way to the Makonde plateau in east Africa. After a shakedown cruise from Friedrichshafen to Yambol in early November, L59 set out from Bulgaria on November 21 with a crew of 22 under the command of Kapitänleutnant Ludwig Bockholt. Over Khartoum (in the Sudan), the flight was aborted, apparently due to a message to the ship to turn back because, said the message, the German forces in Africa had just surrendered. (The message was a fake, sent most probably by British intelliegence. In reality, Lettow-Vorbeck didn't surrender until late November of 1918, well after the armistice in Europe.) 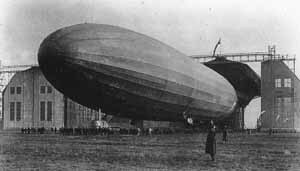 Thus, what would have provided a strategic and psychological boost for Germany's war effort turned into simply the first intercontinental airship flight, for after returning to Yambol, L59 had covered almost 7,000 km (4,350 miles) non-stop in 95 hours, an incredible, unique feat at the time, and one that paved the way for the global airship flights of the 1920s and 30s. L59 was then converted into a bomber Zeppelin to be used in the Mediterranean against British targets, for example, in Malta and Port Said, and against targets in Italy. The airship went into battle service in February, 1918. The city of Naples was totally unprepared for an attack. The city was not even blacked out, for no one had seriously considered the possibility of aerial bombardment. Zeppelin raids such as those in northern Europe were already less effective than they had been in 1915, when the first Zeppelins had bombed London. By 1918, airships had become increasingly vulnerable to improved anti-aircraft artillery and to being shot down by fighter planes. Also, there were, by that time, very functional bomber airplanes. These planes, however, couldn't reach Naples from Germany. And it was implausible that a German airship could fly 1,000 kilometers over enemy territory, Italy, to attack Naples. Yet, L59, indeed, came in —but from the airfield in Bulgaria (about 1,000 km away)— and on the night of March 11/12 bombed Naples. According to a German source, the airship successfully bombed the naval port and the gas works in Naples, as well as the steel mill and port in Bagnoli. It was a high-altitude attack, with L59 staying well above 10,000 feet. The Naples daily paper, il Mattino, devoted more than half the front page (photo, above) the next morning to the raid. The paper said that the raid had started at one o' clock in the morning and lasted for about 40 minutes. In all, about 20 bombs had fallen. None, according to the paper, had hit a military target; all had fallen to the north of the port in the center of town, killing 16 civilians and injuring more than 40. The paper made no mention of a raid on the steel mill in Bagnoli. Most of the rest of the coverage is rhetoric about the barbarism of Italy's WW1 enemies, Germany and Austria. Add Naples, said the paper, to the list of heroic cities such as London, Paris and Venice, all of which had had to withstand such Teutonic savagery. 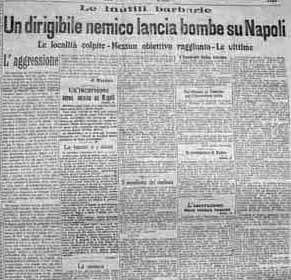 In the days following the attack, the paper reported that the officer in charge of anti-aircraft defence in Naples had been relieved of his command. The raid on Naples was a one-time affair. Less than a month later, on April 7, 1918, L59 exploded mysteriously in mid-air over the straits of Otranto in the Adriatic. There was speculation that it had been hit by "friendly fire" from a German U-boot that had mistaken L59 for a British airship. Some German reports of the day said that the airship had been shot down by enemy fire. Neither scenario seems to have been the case. The exact cause, probably a technical mishap that ignited the highly flammable hydrogen in the gas bags, remains unknown. Click here for an item about another intrepid airship adventure and the story of Umberto Nobile.